Just one taste of homemade beef jerky and you will never go back to buying this tasty treat in the store again. The trick to making the best beef jerky is twofold. First you must choose the best cut of meat. Top round, flank steak, London broil, or a top sirloin roast all work very well for this purpose. The next trick is in choosing a marinade, which will impart all of its flavor to the meat. The right marinade will make an amazing beef jerky your family will not be able to get enough of. 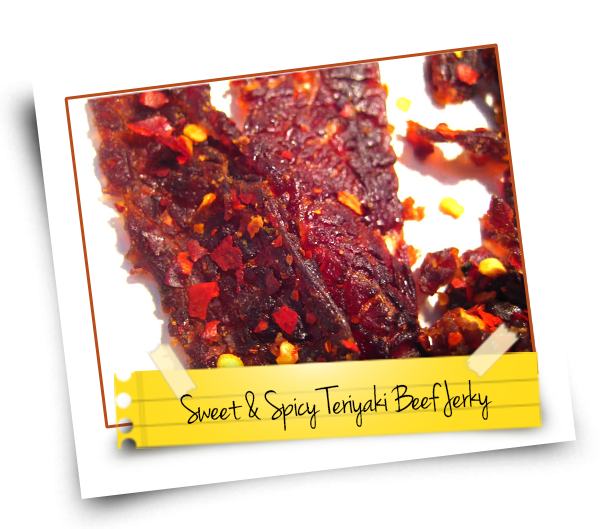 This teriyaki beef jerky is both sweet and a bit spicy. Choose only lean meats, and meats that can be trimmed. Fat turns rancid on beef jerky. Trim meat carefully removing all visible fat. Freeze meat until it is still slightly pliable and easy to cut through, but has started to form ice crystals. This will make your meat easier to cut. Cut meat across or against the grain. This makes jerky tender and easier to chew. Strips should be no more than a quarter of an inch thick. Layer meat in a deep bowl or place in Ziploc baggies. Combine all marinade ingredients, except chili flakes and pepper, in a blender and process until all the spices and sugar is well dissolved. Add chili flakes and pepper to the marinade and mix well. Pour marinade over meat to coat well. The marinade should cover the meat completely. Cover meat or seal bag. Keep mixture in fridge for 12 to 24 hours. Stir the meat and marinade mix occasionally to ensure all of the meat slices are well coated. The marinade will settle over time, so make sure to mix well. Prepare dehydrator by covering plastic trays with plastic sheets or plastic wrap. The remaining fats from the meat can damage trays over time if you do not protect them. Lay meat out on paper towels to drain off excess marinade, then place them on dehydrator trays allowing plenty of room for air circulation. Cook jerky at 160 to 180 degrees for 4-8 hours. Jerky should be cooked all the way through and dry enough to break pieces off easily, but still flexible enough to bend. Seal in an airtight bag or container, for longer storage keep in the refrigerator. Jerky can also be frozen for even longer term storage.